You are here: Home / Free Tarot Cards / Should Tarot cards be sold in the USA for playing actual card games? 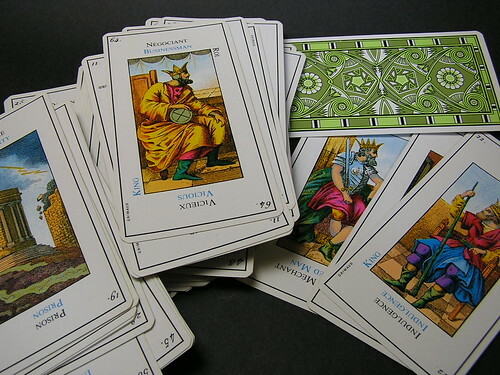 In European countries such as France, there are Tarot cards sold to play actual card games similar to Spades and Bridge. According to most historians, Tarot cards were originally intended for card games and not for divination. However in countries such as the US, Tarot cards are only sold for fortune telling purposes and most Americans only associate Tarot with divination. Do you believe this situation should change? Would you play actual card games with Tarot? Should Tarot publishers supply game rules with Tarot decks? I use tarot cards for divination and I don’t think they should be used for a game. Tarot cards have a different energy than regular playing cards do and it wouldn’t be a good idea. Tarot cards today are different than Tarot cards in history, they like everything else have evolved. I agree, tarot cards are not for game play. They have a purpose and any use outside that purpose will foul them for their intended use. Other than when you are told by the reader to shuffle/cut/select the cards no one but the reader(owner) of the deck should handle them as this will allow them to absorb energies from outside sources and make it hard on the owner to get a proper reading from them. As a tarot reader, I would love to have instructions for the game Tarocci (sp?). I love to play cards, in any shape or form. Any cards, anything as that goes, can be used for divination. Situation change? well, add instructions for the game, but don’t exclude the divination use of the cards. How can i start using tarot cards? I’ve recently started to get interested in tarot cards, but honestly i dont know where to get started and i have many questions. 1.are tarot cards “evil” in any way? 3.is there anything i should know before i look further into this interest? Tarot cards are not evil at all. They are a tool to help in a psychic reading. They can help you strengthen your gift because the cards never lie. Meaning that the are highly accurate. You can buy some from a metaphysical shop or a book store like Barnes and Nobel. When you get your cards you should be the only one who touch them. Only your energy needs to be on the cards. You can use them on family and friends to practice. When I brought my first deck I slept with them under my pillow at night. That helps seal your energy in your cards to get an accurate reading. Tarot cards are not toys or a game. They are tools of deviation. Just have a clear mind and be serious about this art. You will be fine. It is bliss to buy psychic ability! I’ve been to a place that prints these cards, the company I work for sells playing cards wholesale. Not all of them of course because there are many styles of decks. They have do some impressive artwork, and there is one that goes along with the vampire craze. So what make them so special compared to other printed items? Is it the cardboard? The inks? Both? Well I’ll tell you a true story. The cardboard comes from trees from a secret magic forest in Austria. During WW2 none of this wood got to the USA, as the Nazis used it themselves. But what they lacked was quality ink and Hitler’s people had poor results. The best magic ink is made in the USA and trades on the market at about $ 133.00 per gallon. That is why the cards cost so much. Also there is a lot of quality control. The cards get tested by groups of elves to make sure that when used, randomness is not an issue. Unless they are printed in China. They use plain cardboard and regular inks. These will result in random spreads every time. So buy American and spend lots of money on lots of decks. And don’t forget the velvet pouches to store them. Spend more money. I created a section on my web site for exactly this. Then I added an online virtual Tarot deck to allow people to do Tarot without owning cards. I’ve found that it is just as valid and accurate as using real cards. It’s really good for learning and practising spreads and has interactive help with the card meanings. The “magic” of Tarot is in you, not in those pieces of cardboard! No, they are not evil in any way. First of all, evil does not exist. Second of all, tarot cards are merely slips of paper with pictures on them… incapable of doing harmful acts without assistance from a person. If the person handling them intends no harm, the worst that could happen might be a paper-cut. You can find decks for sale in a lot of places online… Amazon.com, eBay or any of the numerous metaphysical shops online. You can also check your local bookstore, but I recommend visiting a local metaphysical shop as they are local businesses that you can support, but they are also more likely to have a wider selection and to know what they are talking about when it comes to tarot decks and books. Before you go, however, I recommend looking at card samples online to get an idea of which decks appeal to you most. You learn how to use them by studying them and practicing with them. first, you must select a good deck. The best decks to train with are usually based on the Rider-Waite-Smith deck, but I fidn that deck to be rather ugly. Other decks that are closly related would be the Morgan Greer deck, the Hanson-Roberts deck, the Fenestra tarot or the Los Scarabeo company deck. You want a deck that you find both aesthetically apealing to you and a deck that “speaks” to you with powerful iconic symbolism. Any deck will do and you want to get a deck that you feel “drawn” to. That said, if you start with one of the decks I mentioned and study for a while, you’ll be better able to tell which other decks might work well for you so you can get a second deck that may be much more appealing and fun to use. Cards can’t predict the future. The future is a fluid abstract that changes with every choice you make. A good way to study is to spend time with each card… maybe one or two each day. Read the book that comes with the deck. Read any other books you can find on tarot. Read websites about card meanings. Journal about your studies and your impressions of the card, but mostly LOOK at the image on the card and try to see what YOU see in it. Ultimatly, no matter how many books you read, your interpretation of the cards will depend on your own personal reaction to the image and what YOU think it means, which may be different then the “traditional” meanings. When you’ve gone through each card, go through the suits numerically. Pull out all the aces and compare them, then pull out all the twos, threes etc and compare them to each other. This excersise will help you understand how the suits are laid out… it will give you a grasp of what the numbers mean and what the suits mean. Then go through the major arcana and look for the story of the fool… Google “Journey of the Fool” to see how the major arcana is laid out and which cards indicate what stages of personal development. I found these exercises useful. Keeping a journal is a common and very valuable way to train yourself with the cards. Record impressions of each card, record readings you do to check back and see how effective the readigns were etc. Also, develop your own personal rituals involving the cards. Try sleeping with the deck under your pillow, knocking on the deck with your knuckles, using a special cloth to do your spreads on etc… it helps to make them feel “special” and get you in a calm state of mind to do readings. Always trust your deep gut and intuition. If you feel that something is right, then forget what ever else you’ve heard about it and do it your own way… that’s the whole point of divination systems… helping you tap into your OWN personal knowing. What are the best tarot cards to represent internal conflict? The tower, death, hanging man, and many of the sword cards inverted. Well, I use the Faery Wicca Tarot deck, and also Spiral Tarot deck. I find that the Faery wicca cards really elaborate in their explanations, and a good card to represent conflict from that deck (there are several) would be many of the Aer cards, and also maybe the Round Tower, ancient card # 16 Or number 15 the Old One. well, look into it. Hope i helped =) blessed be and good luck with your project. Previous article: In a tarot card reading what do the following cards mean? Next article: Just curious, is it worth it to pay for a tarot card reading on whether or not I should pursue a relationship? what does is mean to dream about tarot cards?